This is the Best Chocolate Cheesecake recipe! Each slice is rich, creamy, and topped with chocolate ganache! 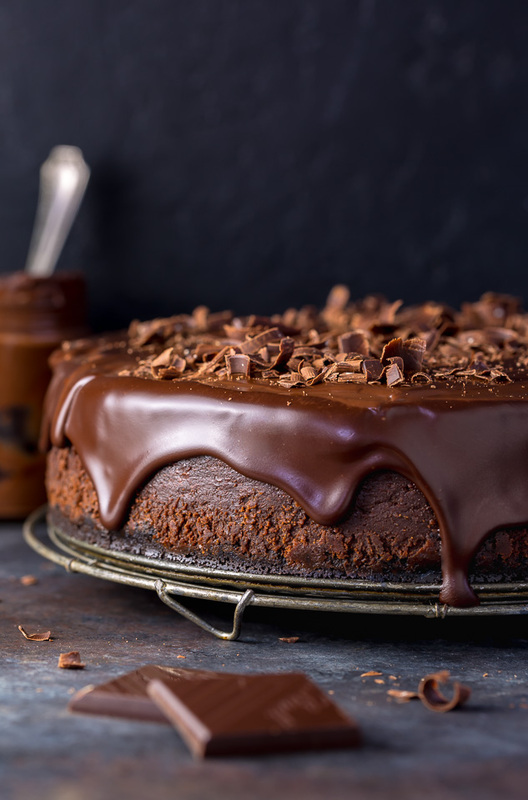 If you’re a chocolate lover, get some quality chocolate and try this ultimate chocolate cheesecake recipe today. The day has arrived! 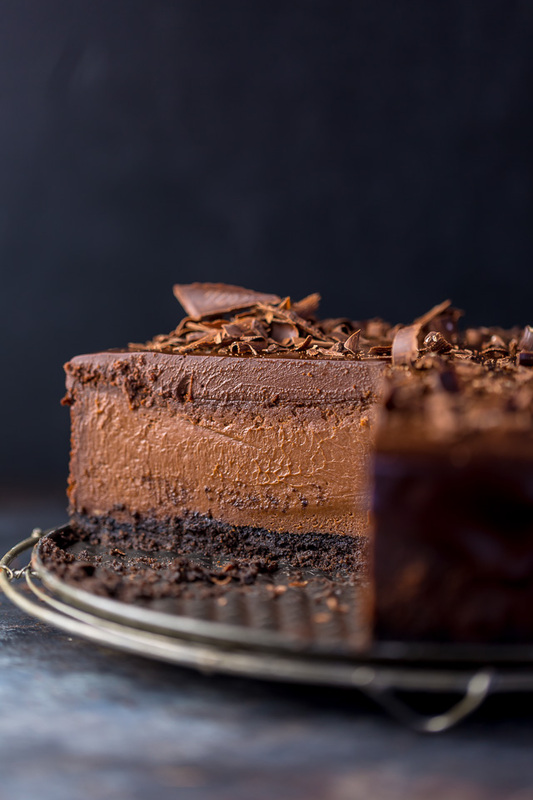 I’m finally sharing the recipe for my favorite chocolate cheesecake! You know… the one I teased you with on Instastories last week! And trust me, it was worth the wait, my friend. 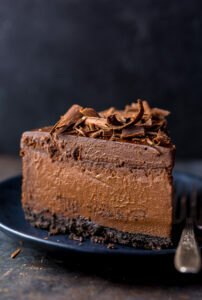 Because this thick and ultra creamy chocolate cheesecake is one of the best things I’ve ever baked! It’s so smooth and creamy it melts in your mouth. We made it for Christmas Eve last year and everyone wanted the recipe. And I’ve already received multiple requests to make it for our family Valentine’s Day party. I don’t mind one bit because this cheesecake is freezer friendly! Meaning I can make it up to two months in advance and then just pull if out of the freezer when needed. Does it get better than that?! Yes, this baked chocolate cheesecake recipe does require a water bath. But I promise it’s not as scary as it sounds! If you’re unfamiliar with the water bath process, the information below will help you understand why and how we use one for this recipe. 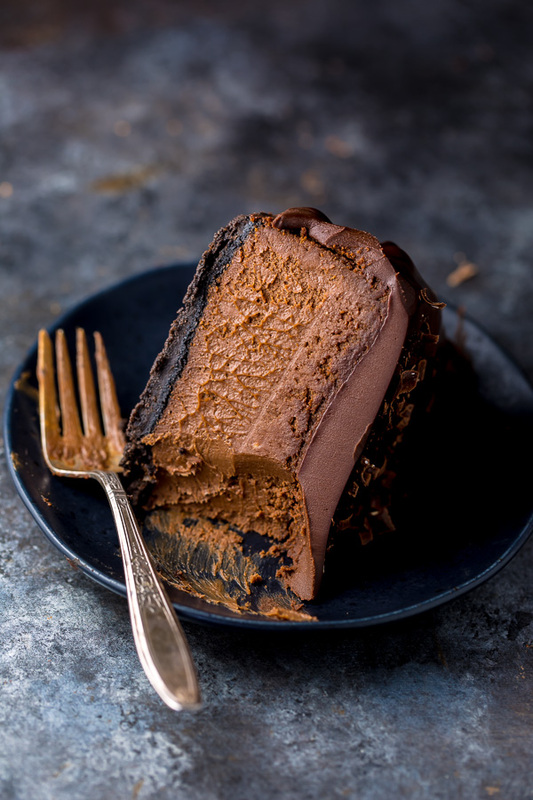 How do you Defrost Rich Chocolate Cheesecake? 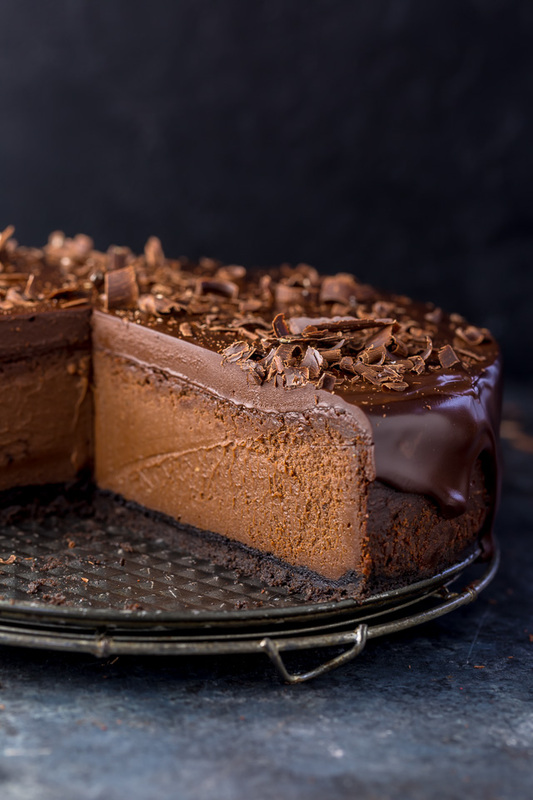 Rich, creamy, and supremely flavorful, this is the ultimate chocolate cheesecake! THIS!!! But I wish you made a video of the water bath! Its easier if you see it vs read it! These is a video for this recipe 🙂 You can find it one the homepage sidebar. OMG, I made this for my fiancé for Father’s Day (yesterday) and he loved it, he said it was the best cheesecake I’ve ever made. Word to the wise – this cheesecake is very rich is decadent, just be prepared. 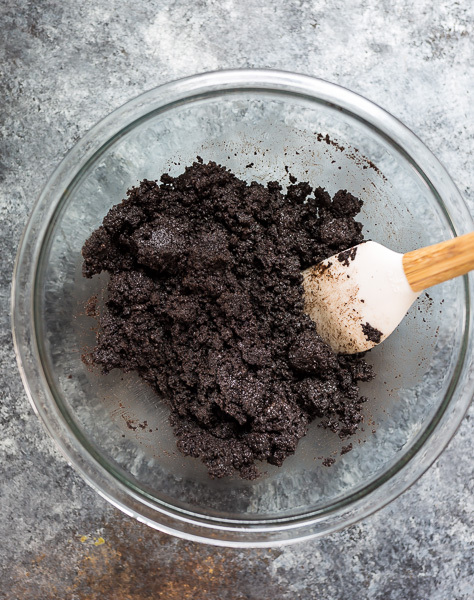 I improvised on a few things – I couldn’t find the chocolate wafer crumbs so I improvised and used crushed Oreo cookies and added homemade whipped cream. My plan is for us to eat half of the cheesecake and freeze the rest; I’m crossing my fingers we have the self-discipline to actually do this lol. This recipe is definitely going into the dessert rotation! Thanks for another great recipe!!! Undoubtedly this cake is a mouthwatering treat. Well, there is a party at my house next week and I will make this cake. I am sure my guests will enjoy. Thanks, Ashley for sharing such an amazing recipe with us. Wow! This cheesecake is amazing! Thanks for sharing! Hi is wafer crumbs a particular cookie/biscuit? Or is it any type of chocolate cookie/biscuit? This recipe is just PERFECT!! Ahh, thank you so much for sharing it with us! Hi! Id like to try this in cupcake sizes but i dont know how to do the water bath for that. Do you know if it will work if i put the water tray in the rack below the cupcake tray? Yummy 🙂 Please try to share in Video format that will be great helpful for us. Cheesecake looks amazing but don’t we need to add sour cream in it? Normally all cheesecake has sour cream as one of the ingredients? This one does not need it. 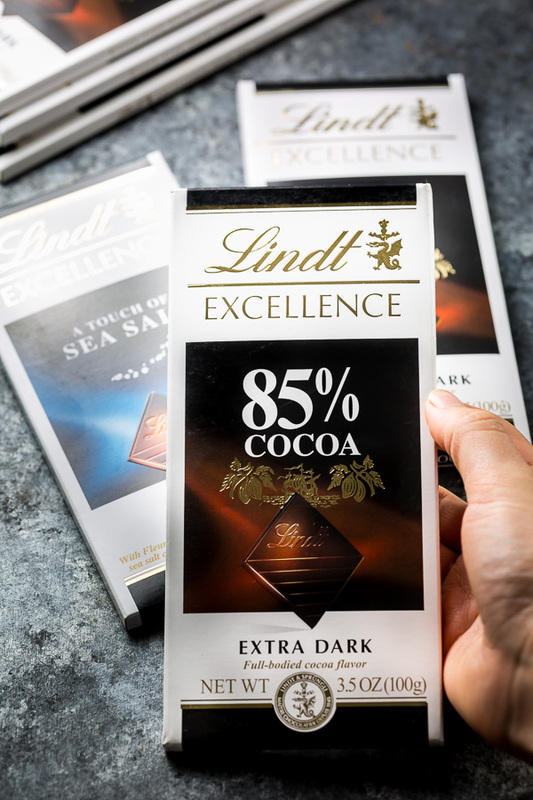 You must try it if you looove dark chocolate! It is absolutely deeelicious! Rich, creamy, melts in the mouth! Chocolate, Chocolate, Chocolate LOVE!!!!! Soooo yummy good! I was wondering if you have a video of this recipe? I’d love to make it for Thanksgiving but I’m a beginner! can we substitute milk chocolate? @bakerbynature which chocolate wafers do you suggest? I absolutely LOOOOVE this cheesecake recipe!!!!! Thank you very much for sharing it with us! I bought my Nabisco Chocolate Wafers online. Do you know if they can be frozen for longer storage? My batch were not past the expiration date, kept in a cool dark place, ( air condition room in the heavy packing envelope it came in away from the ☀️), and I thought it had an off flavor. It is difficult to find these in stores here. You can find chocolate wafer crumbs where you find Graham wafer crumb. There are also pkgs of plain chocolate cookies ( no filling etc) in the cookie aisle of most grocers. 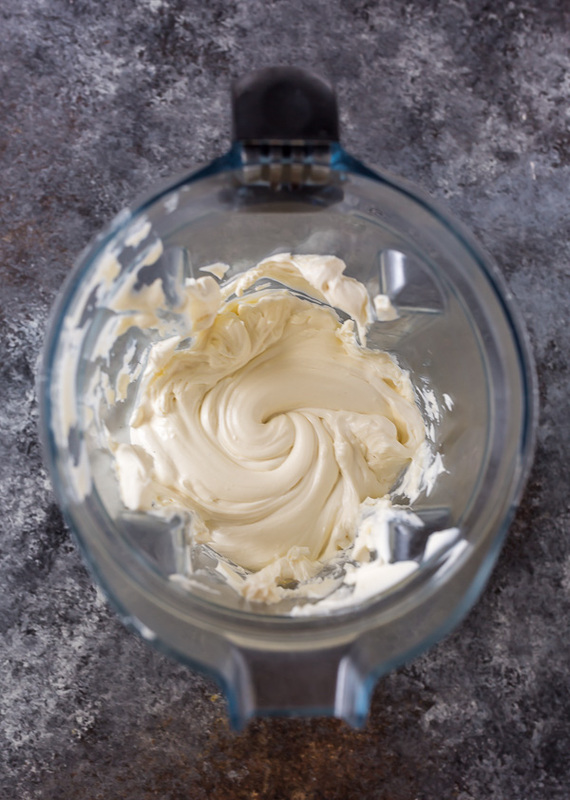 What do you make the swirly globs on top of the cheesecake with? Is that also the ganache? Thank you immensely for this delicious absolutely Lucious looking recipe!! Christmas Day table bound!! Mmmmm….. YES!!!!! How did it go? I made it for New Years. It was ABSOLUTELY DEEELICIOUS!!!!! What do we do in countries with no Heavy cream? :S How do I substitute it? I made this cheesecake using 1/2 & 1/2 because I didn’t have heavy cream, and it turned out absolutely delicious. I did use the heavy cream for the ganache the next day so I can’t speak to that. Insane cheesecake. Imagine a cake size piece of the best Belgian truffle or Sees Candy. Now spend as much time as you can stand savoring it, bite by bite. I’m so jealous! My only caution is the ganache. There’s a lot and it makes a huge mess if you’re a novice (like me). Next time I’m going to add most of the ganache before taking cake out of pan. After refrigerating til firm, I would then use the remainder to drizzle off the edges with cake removed from ring. Amazing recipe. Went down a treat! Made this and it was gone in 3 days! I am not a fan of rich cheesecake but this is like eating a smooth chocolate mousse. Delicious! I will definitely make this again! I usually will not eat any chocolate higher than 60% cocoa but you can’t taste the bitterness in the cheesecake. I made it with 70% and was good but I think I will try a darker one next time. It is soooo delicious!!!!!! I love bittersweet chocolate though. I used 70%. Next time I want to try 85% or 100%. I do not like things very sweet. Thank you soooo much Ashley! This Triple Chocolate Cheesecake was FABULOUS!!!!! I made it for the New Years Family Gathering. I am a Chocoholic!!!! And we have several Dark Chocolate Lovers in the family that looooved it just as much as I did!!!!! I did modify it a bit… I also love coffee, so I added 2 slightly heaping Tablespoons of finely ground good Espresso to the Cheesecake Batter. And I reduced the sugar a little since I can only eat a certain percentage of sugar. And I added a pinch or two of Kosher Salt into the Cheesecake Batter, since I added the Espresso. Hi, can I skip the water bath? I do not know on which temperature baked and also 1h seems a lot. The filling is wonderful. We have a small family run coffee shop and have baked this over the weekend to add to the menu. Cheesecake has never been my strong point, but it came out quite well, or as I say it, sellable! Not as silky as yours looks in the picture, but firmer and bit crumbly. Will experiment with a slightly lower temp or shorter oven time. Maybe my waterbath wasn’t high enough? This is delicious and so creamy. I did make a few adjustments due to not having a few grocery items. I used peanut butter cookies to make the crust in my blender. I left out the sugar from the crust since the cookies were sweet. I used semisweet chips in place of the bittersweet chocolate and used only a 1/2 cup sugar. I didn’t have heavy cream so I used 1/2 & 1/2. Since I used peanut butter cookies to make the crust, I decided to make a chocolate peanut butter ganache for the topping. It was delicious. Can’t imagine the cheesecake being any better by using the heavy cream, but I bet it is. Hi! I I would love to bake this for my daughter’s bday. Here in Italy we don’t have wafer crumbs…..what do you think if I try with chocolate digestive biscuits? And as for the water bath…my oven gives me the option to add steam during any kind of baking, do you think that would work ? It basically adds humidity in the baking…thank you!